More people are calling 999 across the capital about suspected strokes following a national campaign. Figures released today (9 November) show that the London Ambulance Service saw a 42 per cent increase in stroke calls in the four months after the start of the Department of Health’s act F.A.S.T. campaign, which was launched at the Service’s headquarters in February. London Ambulance Service Medical Director Fionna Moore said: “We would always encourage Londoners who think that they or someone they know may be suffering a stroke to call 999 for an ambulance as soon as possible. “The FAST test is very simple and very easy to remember so it can act as a great tool for everyone. “When our staff arrive they will assess the patient, before taking them to the nearest appropriate A&E department as quickly as possible. Stroke patients across the capital will benefit from being taken straight to a specialist hospital from April 2010. Eight hyper-acute stroke units (HASUs) will operate 24/7 in London – patients will have quick access to a CT scan and advanced treatment. 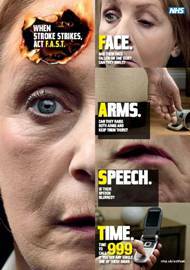 For more information about stroke please visit our Emergency Stroke Care section. This data was taken from a comparison of nearly four months’ 999 calls between 2008 and 2009 (following the launch of the campaign on 9 February), and was based on the chief complaint given by the caller to our staff in the control room.